Economic development cannot happen without the proper skill levels available in the market to ensure that investment opportunities meet capabilities. A study by Osomu, et. al. (2010) delves into the overall concept of creating greater global competitiveness. They analyzed 84 different countries over 5 years to determine how skill development through formal education and corporate training raised economic viability and encourage foreign direct investment in high technology environments. Technological progress and globalization has created rapid changes in the environment putting pressure to create productive and innovative approaches that are supported through the comparative advantages of skills, industrial organization and management practices (Lall, 1999). The process of creating stronger businesses and management practices must meet available market skills to create competitive advantages for the region and the market. The types of skills vary based upon what industry labor is employed. However, there are some commonalities in the global market that appear to create competitive advantages. Skill development should include communication, team work, rotation, quality, problem-solving, health and safety, and performance-pay linkages (Low, 1998). Each industry will need to develop specific skill qualifications that enhance their positions. Prior success of the country is based on a number of factors. Through a previous analysis of market factors it was found that human capital investment in the early twentieth century helped the country gain competitive edges in technology, education, and human capital while lowering the damaging effects of inequality (Goldin and Katz, 2008). This period was marked by economic and social dominance in world markets that carried through to Baby Boomers. This development is based within the cognitive, analytical, and behavioral development that allows people to invent and adopt new technologies and ways of improving production (Lall, 2000). The overall process of learning, integrating best methods, and putting them to practical use fosters greater and faster growth. The management and labor population must be open to new ideas and developments to be effective. Skill formation can be developed from a number of different sources. It is most often raised in vocational training, formal education, in-house training, outsourced training and on-the-job training (Lall, 2000). Organizations seeking to raise their market value and contribute to economic growth will need to support higher education as well as training & development within their organizations. The model used by the researchers to analyze skill development within the country helps to understand how skill and economic development work together. The concepts included in the model are high technology exports, Harbison Myers Index based on education enrollment, science and engineering enrollment, gross domestic product per capital, and net foreign investment. The researchers used these concepts based upon previous research to create the mathematical model that helps to understand labor development and economic growth. 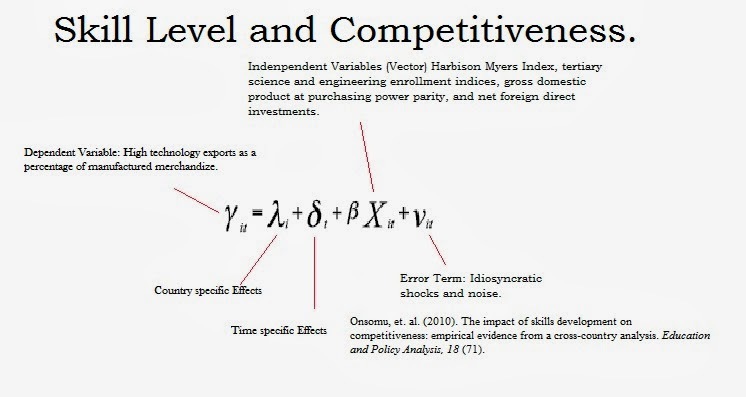 The researchers found through this model that the factors were statistically significant and accounted for 99% of variation in competitiveness. Skills were important for global competitive position. Improvement in high technology exports requires the development of skill and investment in education. Low foreign investment was associated with low skill development while higher foreign investment was associated with high technology skill and product development. High GDP per capita and purchasing parity was associated with the manufacturing and export of high technology products. The authors recommend reforming education across all levels to encourage market relevance. Comment: The study is significant in that it highlights the need to develop local skills through varying methods such as on-the-job training, training & development, and higher education to provide the right human capital for further investment within the market. Those markets that focused on matching their skills to high technology exports also realized greater foreign investment that fostered future growth. New development into the post Baby Boomer generation is needed to further the American legacy. Goldin, C., & Katz, L. F. (2008). The race between education and technology. Cambridge: Harvard University Press. Lall, S. (1999). Competing with labour: Skills and competitiveness in developing countries. Geneva: International Labour Organization. Lall, S. (2000, June). Skills, competitiveness and policy in developing countries. Queen Elizabeth House Working Paper Series 46. Oxford: Oxford University Department of International Development. Low, L. (1998). Jobs, technology and skill requirements in a globalized economy: Country study on Singapore. Geneva: International Labour Organization. Onsomu, et. al. (2010). The impact of skills development on competitiveness: empirical evidence from a cross-country analysis. Education and Policy Analysis, 18 (71).